Mini Maker Mondays are our sessions for children 11 and under with their grown-ups. Together we make, create and explore. Each session has a different theme. Children’s tickets are £2 and can be purchased in advance or on the day at our Box Office or online. Mini Makers are every Monday in the school holidays and run from 11am till 1.30pm. From 2019 we are proud to announce Intu supports The Customs House Mini Makers. The Customs House ‘Mini Makers’ is supported by Intu. Their sponsorship means we can freeze our prices, pay for the room and staff’s time. Your £2 means we can keep the cupboard stocked with craft materials keeping your Mini Makers entertained. Browse intu.co.uk and discover over 1000 retailers, shop your favourite items and have them delivered to your home or pick up free at your local Intu shopping centre. We’re here to make shopping easy. We’ve added some information below answering your frequently asked questions but if you have any queries or want more information email Elizabeth@customshouse.co.uk or telephone 0191 427 8198. Purchase your tickets online (scroll down) or from the box office. 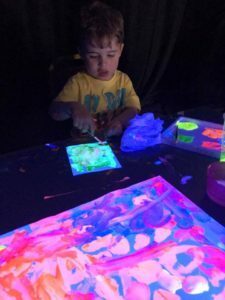 A Mini Maker making glow in the dark paintings (with phosphorescent pigment). How much? Kid’s tickets are £2 from the box office, accompanying grown-ups free. Do I need to book in advance? You can but there are also limited numbers of tickets available on the day. Do we have to come from the whole session? You can stay for the whole session or part of a session and you don’t need to arrive at 11am. Do I have to come to every session? We know family life can be extremely busy so Mini Maker sessions are designed to be stand alone. What should my child wear? We don’t have aprons so don’t come in your best outfit! Mini Makers isn’t messy play but we use paints etc. I have a baby with me do they need a ticket? If they aren’t taking part no. There is limited room for prams in Daltons 5. Can organised groups come? If you are a child minder or providing school holiday activity its best to book online to ensure there are enough places. It would also be useful if you could email Elizabeth@customshouse.co.uk so we can check child to adult ratios are safe. Where does the session happen? Feedback told us people preferred sessions in Daltons 5 workshop across from the main house on the ground floor. What else can I do with the kids in South Shields? Enjoy a meal in the Green Room, take a look at the exhibition in the gallery, watch a film our Studio Cinema, visit The Word, pop into South Shields Museum, enjoy our beautiful Marine Parks, the beach, funfair… definitely the place to be with the family in the school holidays. We post images from sessions on social media follow Learning & Participation at The Customs House on Facebook or @customshouseLP on Twitter.